With over 300 VPNs currently on the market, finding the best VPN for Mac OS can be rather challenging. As a longtime Mac user, I’ve found that many Mac VPN applications simply do not work very well. Whether it’s due to data leaks that reveal your identity or broken features, many Mac VPN apps simply don’t make the cut. Fortunately, there are still a few VPNs that work very well on Mac OS, which we’ll reveal below. This Mac VPN guide highlights five VPN services that passed all tests for security and performance. The best VPN for Mac OS, based on all the testing conducted for this guide, is ExpressVPN. While NordVPN came in a close second, it’s also important to point out that all of the Mac VPN services listed on this page offer great apps that work very well on Mac OS. Therefore take your time browsing this page, examining the features and VPN providers, then selecting whichever service best meets your needs. Offer a custom Mac OS VPN apps using the OpenVPN protocol and strong encryption standards. Located in a good privacy jurisdiction (outside of 5/9/14 Eyes countries). Passed all tests with no leaks found whatsoever (no IP address leaks or DNS leaks). Established company with a good track record and history (no new/unknown VPN providers). Offers a money-back guarantee (between 7 and 30 days). Now let’s get into the test results. While there are many providers claiming to be the best VPN for Mac, the latest test results show that ExpressVPN earns the title. It’s based in the British Virgin Islands and offers a high-performance network, superb applications for Mac users, and a large selection of server locations. ExpressVPN is also a good choice if you enjoy streaming or torrenting. It currently holds the spot as both the best VPN for Netflix and also the best VPN for Kodi. While ExpressVPN does not offer any port-forwarding features, it’s still one of the top recommendations in the VPN for torrenting guide. The ExpressVPN apps include advanced leak protection features, split tunneling, and secure DNS. Their support is also top-notch, with 24/7 live chat assistance and a 30 day money-back guarantee with all plans. 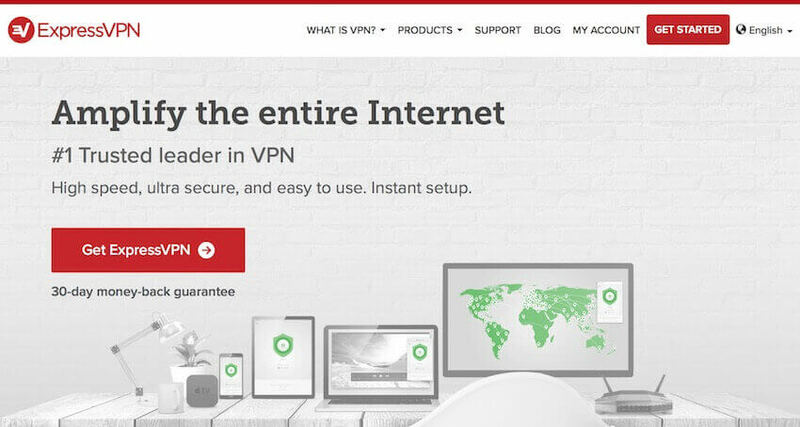 Right Now ExpressVPN is offering an exclusive discount for three months free. 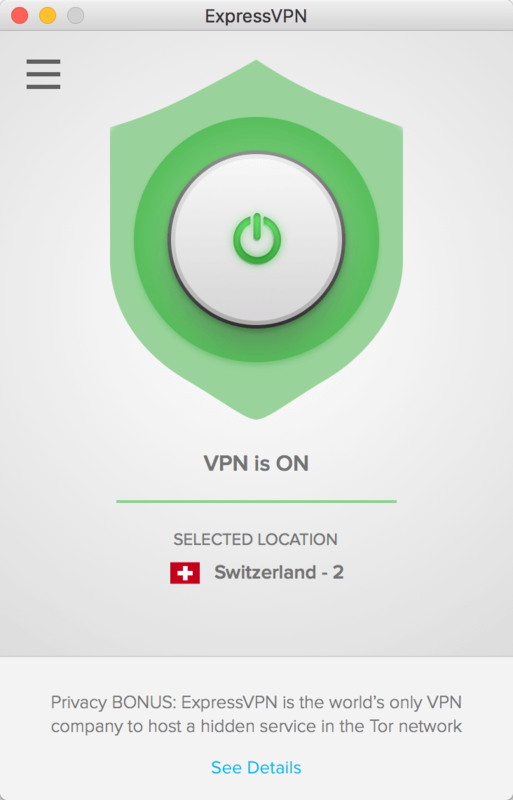 NordVPN also offers a great Mac OS OpenVPN client that is user-friendly and fully-featured. These privacy features include double-hop VPN servers, Tor-over-VPN servers, as well as an ad-blocking feature called CyberSec. 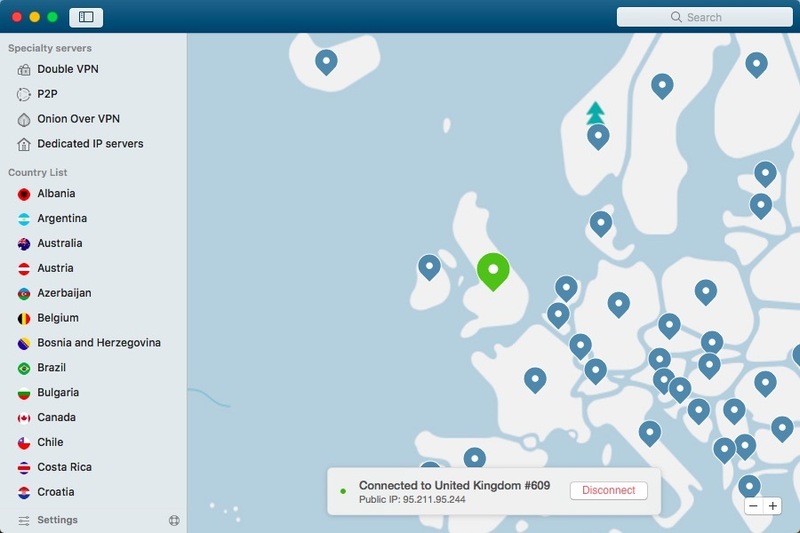 You can also see on the NordVPN website that they offer a huge selection of servers around the world. One of the main drawbacks with NordVPN, however, is that speeds can be somewhat variable throughout the server network. But as I pointed out in the NordVPN review, speeds have greatly improved since they added hundreds of new servers over the past year. I was able to get near-maximum baseline speeds on most nearby NordVPN servers. OpenVPN Mac app – This app uses the OpenVPN protocol, but only offers an “app kill switch”. This means that if the VPN connection drops, certain apps will be automatically shut down, but internet traffic will not be blocked through the firewall. 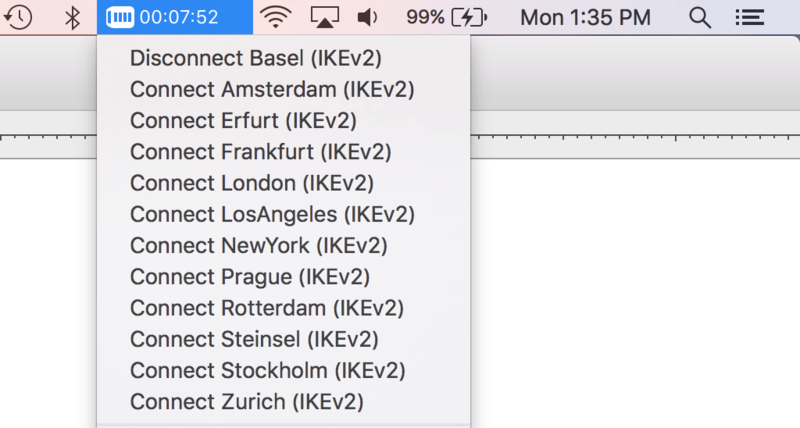 IKEv2 Mac app – This Mac OS VPN app is available only through the Apple store and includes an “app kill switch” as well as a firewall-based kill switch that will effectively block traffic if the VPN connection drops. 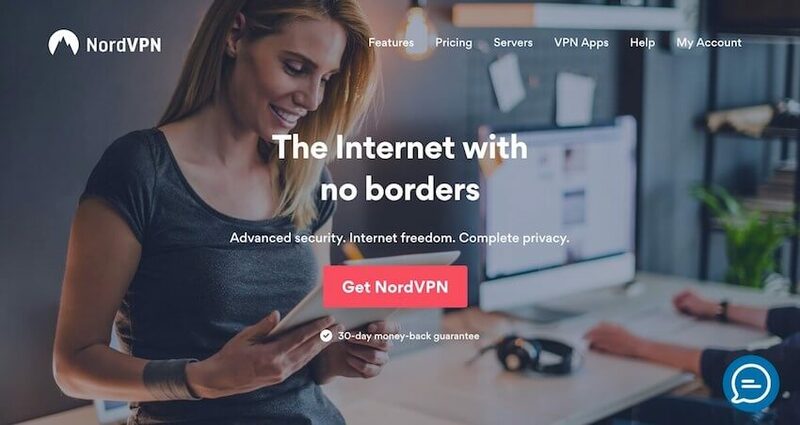 Considering the 75% discount prices currently being offered, NordVPN is certainly one of the best values for a basic, user-friendly Mac VPN service. 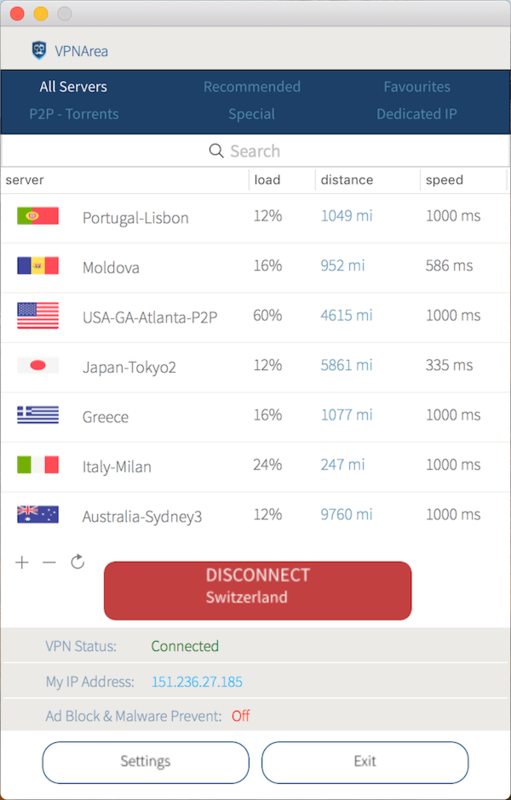 VPNArea is a smaller VPN provider out of Bulgaria that offers a good Mac OS client with lots of features. It is a great choice for privacy-focused users due to VPNArea’s no logs policies, excellent jurisdiction, secure applications, and ad-blocking DNS servers. Extensive testing of the Mac OS client did not find any leaks, problems or bugs. VPNArea is also a good choice for streaming and torrenting. It is one of the few VPNs that continues to work with all major streaming services, including Netflix, BBC iPlayer, Amazon Prime, and Hulu. They also offer a wide range of servers that are optimized for torrenting and P2P filesharing. It is one of the few VPNs that offer a static IP, which may be useful for some users. Additionally, VPNArea provides great customer support with 24/7 live chat assistance, a user forum, and a 7 day money-back guarantee. With their Mac VPN app, you also can use the server-side features of TrackStop (ad and malware blocker) as well as the NeuroRouting feature. While Perfect Privacy is one of the most fully-featured Mac VPN apps you will find anywhere, it is also quite expensive, at about $10 per month with the two-year plan (€8.95/mo). Nonetheless, if you are looking for a secure, fully-featured, high-performance VPNs on the market, it is definitely worth considering. Below I’m using the Perfect Privacy Mac VPN client, cascading my VPN connection over three separate servers: Berlin > Amsterdam > Oslo (see the benefits of this in the multi-hop VPN guide). VPN.ac is another great Mac VPN that performs very well in all categories – from security to speeds and performance. VPN.ac is run by a small team of network security professionals (Netsec Interactive Solutions), with a focus on security and overall quality. Their Mac OS client performed well in testing for the VPN.ac review – no leaks, bugs, or problems to report. The network speeds and reliability were also quite impressive (up to 100 Mbps). 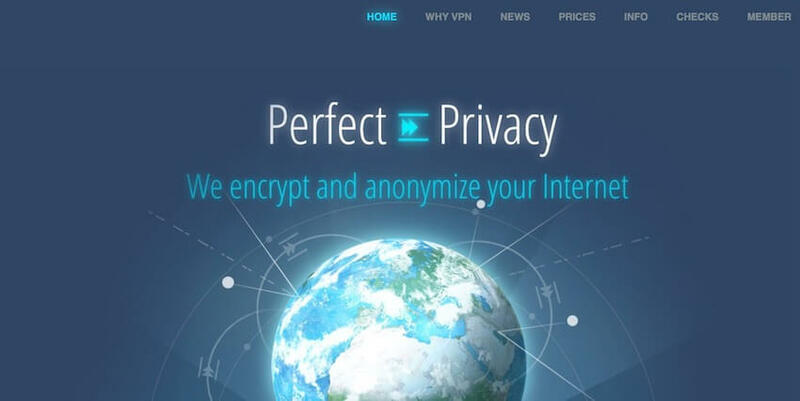 VPN.ac is mainly a privacy and security-focused VPN service. They offer some interesting features such as double-hop VPN configurations, various VPN encryption protocols, and a secure proxy browser extension for Chrome, Firefox, and Opera. While these unique privacy features are great for some users, VPN.ac is not the best option for streaming and they do not offer live chat support. Nonetheless, their Mac OS VPN client is secure, user-friendly, and it offers great features and performance. The one drawback with VPN.ac is that they keep basic connection logs for security purposes, but these are erased daily and never include browsing/activity logs. Go to the ExpressVPN website and sign up for a subscription. 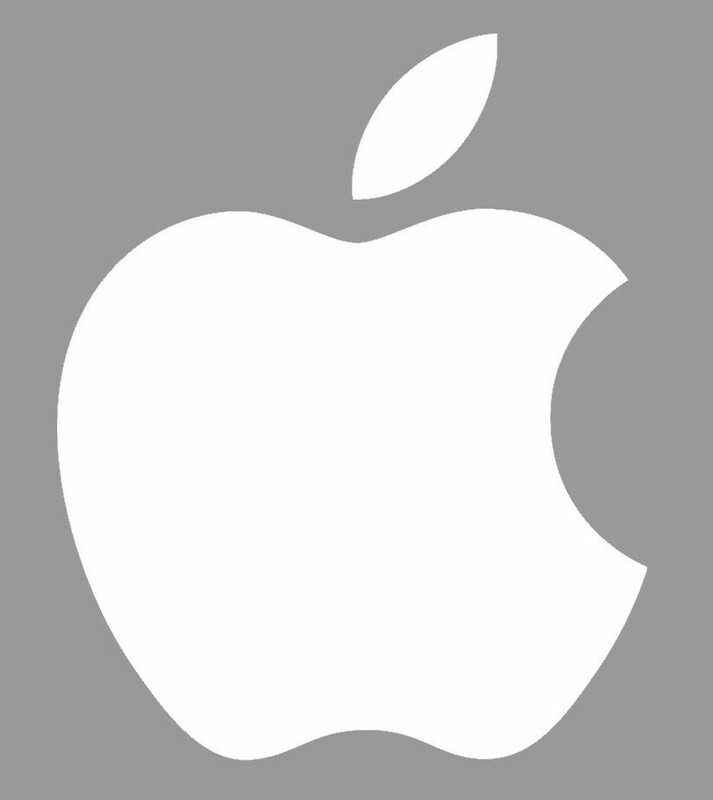 Log in to your account on their website, then download the application for Mac OS. Connect to a VPN server and enjoy using your VPN service. The steps above explain how to install a dedicated VPN client on your Mac operating system. However, there’s also a way to use a VPN on your Mac without any clients/apps using the IKEv2 protocol. Another option available on Mac OS (El Capitan and later) is the built-in IPSec/IKEv2 VPN settings. This is an app-free solution that integrates directly with the Mac OS operating system and firewall. 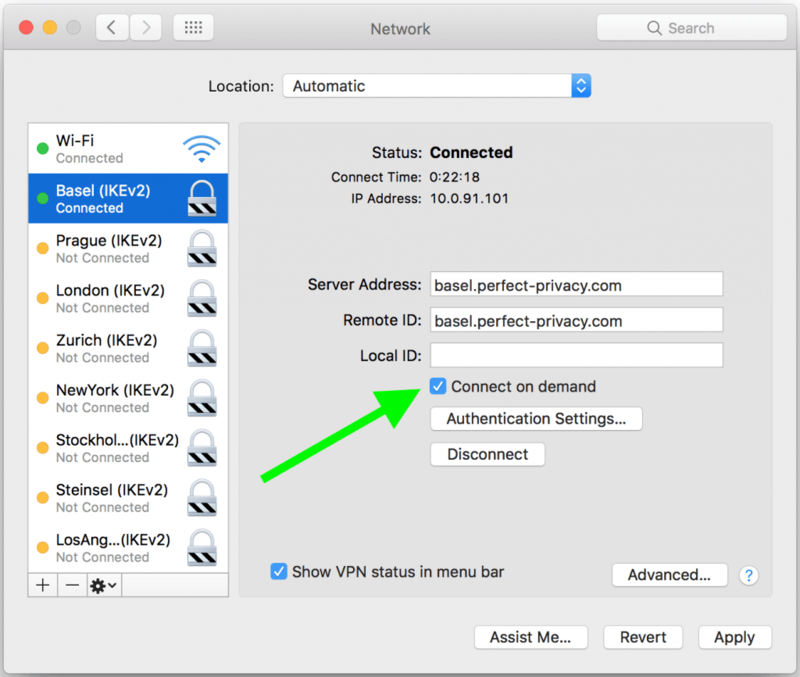 When you use this VPN setup on your Mac OS, it will essentially create an “always-on” VPN when you select “connect on demand” from your network settings area. What this means is that it will work perfectly with your Mac OS firewall, forcing all apps through the VPN connection. No VPN connection = no internet connection. This makes for a 100% leak-proof VPN that does not crash or stall out like many OpenVPN apps on Mac OS. To use this setup, you simply need to import the IPSec/IKEv2 configuration files from your VPN service into your network preferences area. Once you have imported the server configurations, you can simply connect directly from the Mac OS X menu bar – no apps required! The built-in IPSec/IKEv2 VPN setup is a great option for Mac OS users. 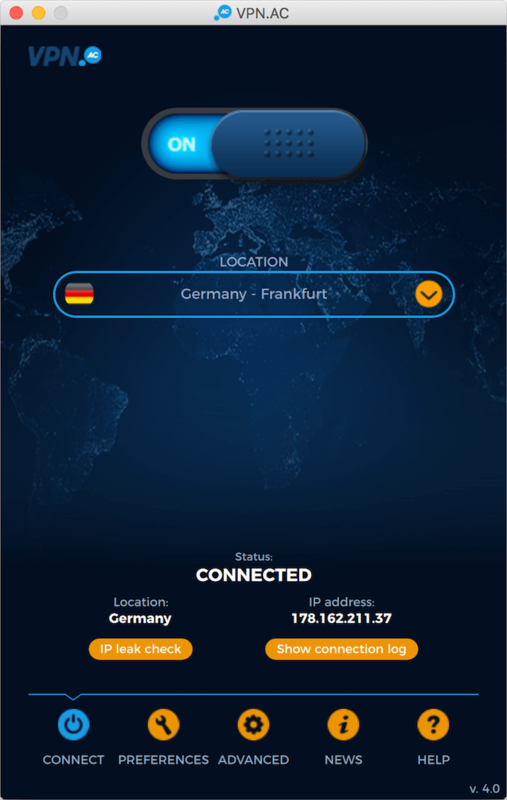 This shows you your real-time connection status, along with the server you’re connected to in the drop-down menu. In the screenshot above, I have imported the server configurations I want to use from Perfect Privacy, which fully supports the IKEv2 protocol throughout their server network. See Mac OS IKEv2 setup instructions here. Leak proof – To make your setup leak proof (no IP address leaks) simply activate the “Connect on demand” option. This utilizes the native Mac OS firewall and forces all traffic through the VPN. It basically acts like a kill switch and will automatically block all traffic if the VPN connection drops. Perfect Privacy – If you want to utilize the IPSec/IKEv2 setup, Perfect Privacy is a great option. You will also benefit from their server-side features, which will be active whenever you connect to the VPN. VPN.ac – VPN.ac is another option that offers support for the built-in IKEv2 setup. Tip for School or Work Computers: If you are on a school or work computer that will block third-party software (such as OpenVPN apps) from running on the operating system, then this IKEv2 setup is one of the best solutions. It will not show up as third-party software on your machine, while still giving you a simple, easy VPN connection whenever you need it through your Mac OS network settings. Tunnelblick – Tunnelblick is a good, basic Mac OS VPN client that is free and open source. The main drawback is that Tunnelblick is very limited on features – such as a kill switch or IP leak protection. Unless you create custom firewall rules, your regular internet traffic will leak out whenever the VPN connection is not active. Viscosity – Viscosity is a great third-party OpenVPN client that’s offered for Mac OS and Windows. The Viscosity Mac OS client provides many features and customization options. Unfortunately, Viscosity also does not have a kill switch. Leaks – Be careful with leaks when using a VPN on Mac OS. While many Mac VPN clients have bugs and problems with data leaks, all of the VPNs recommended in this guide passed all tests and were found to be secure. You can run your VPN through some basic VPN tests to identify issues. Firewall monitor – A firewall monitor is a great privacy tool that allows you to see exactly which apps are using your internet connection. One great option is Little Snitch by Objective Development. Some people combine the free Tunnelblick OpenVPN client with Little Snitch for a firewall kill switch option. Secure browser – When using a VPN on a Mac it’s good to remember that your internet browser can be a major vulnerability. As discussed in the browser fingerprinting guide, there are many advanced methods to identify and track your activities, even if you’re behind a good VPN. One tip would be to stop using the Safari browser and instead use Firefox with some privacy modifications, such as disabling WebRTC. See also the Firefox privacy and the secure browser guides. As you can see, there are many good Mac VPN options. If you want get going right now with the best VPN for Mac OS, you can try out ExpressVPN with this coupon for three months free (applied on checkout page). While ExpressVPN earned the title of Best VPN for Mac, there are many great options from this guide that may be the best fit for you. Each Mac VPN option has its pros and cons. The goal of this guide was to simply illustrate the different options for Mac users. All of our exclusive Mac OS VPN discounts can be accessed through the links in the table at the bottom of this page. To wrap everything up, the table below highlights the best Mac OS VPN services for 2019. That concludes the Mac OS VPN guide – stay safe and free online! Hi. Nice article. What about VPN Unlimited? 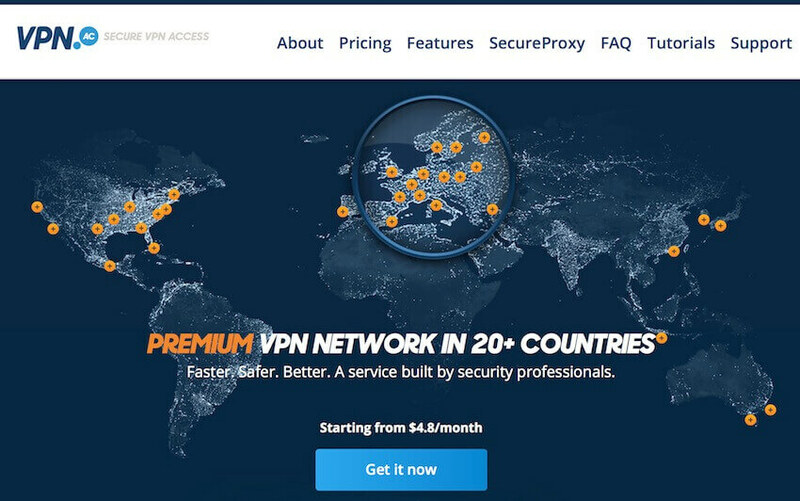 I did an older review of VPN Unlimited, but I’m going to re-review it in the coming weeks because they have launched new apps and they told me the leaks I found are now fixed.. I don’t think so, CPU is probably miniscule and won’t support OpenVPN well above a few Mbps. You need higher CPU to handle the encryption, see the VPN router guide. Have you ever tested and reviewed Mullvad? I’ve used them in the past and not had issues with leaking. Kill switch always worked. They say no logs at all but are based out of Sweden. They also began to lease servers within the last year or so, IIRC. On the other hand they actively publish on security via their blog and have always seemed to take it seriously. Some of the sites above are stated to have “dedicated premium servers.” What makes a server premium? And does that mean though that the servers are rented whereas VyprVPN is stated to physically own all its servers? And if a VPN rents its servers how does it ensure no logs are kept? In regard to John’s question, what about proxycap? I believe you can designate which applications are or are not connected to your VPN service. I have not yet tested Mullvad, but may do so in the future. Regarding servers, dedicated servers are premium in that they are much more expensive and secure when compared to virtual servers (cloud). If the VPN’s network is built entirely on dedicated servers, it will probably be more expensive than cheaper VPNs running on virtual servers. Regarding how a VPN service ensures the servers are not logged, that would be through encryption and securing the server that they control. Regarding VyprVPN, they do state that all of their servers are owned by them. 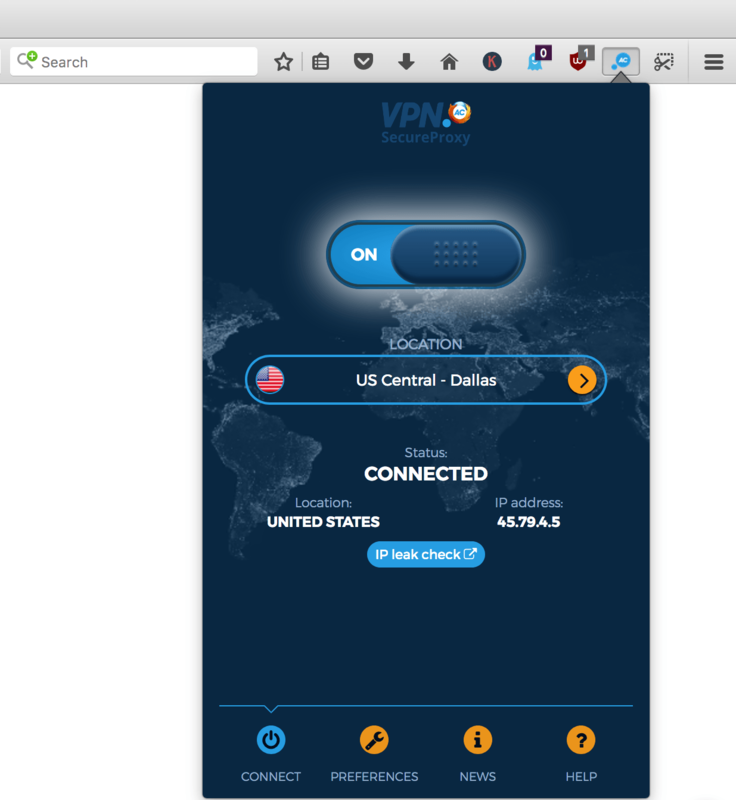 However, there is key issue here: VyprVPN is also using “virtual server locations”. In other words, their dedicated servers are spoofing locations that are not actually in the network. After I discovered this with some of their servers, they clarified the issue in this blog post. Perfect Privacy and VPN.ac are probably the two best choices I have tested when it comes to server network quality and security. Hi, thank you for all the interesting information in your blog. I am using PP and definitely it’s the best. 90% of the time I use it on my iPhone and iPad. What’s your opinion about IKEV2 protocol on iOS? I always use IKEV2 connect on demand because the OPENVPN software sometimes disconnect. I know OPENVPN is preferred by many users because it is open source. Ikev2 is not open source. Hi Rs, yes I also like using Perfect Privacy with the IPSec IKEv2 protocol on Apple devices (both Mac and iOS). Each VPN protocol has pros and cons. Overall IKEv2 is considered a very secure, reliable, and high-performance protocol that can also reconnect quickly without issues. The drawback is that it’s not open source. OpenVPN is open source, but it uses more CPU and also requires a software client to use. As you point out, most mobile OpenVPN apps (whether for Android or iOS) simply do not work well. These apps often have issues with dropped connections, disconnects, and leaks. For this reason, I think IKEv2 is the best option for iOS, simply because it works well, is built into the device (no app), and reliably forces all internet traffic and apps through the VPN (never any leaks with “connect on demand” enabled). Can a subscription VPN be used on one browser without impacting your other browsers and programs? Hi John, normally the answer is no. However, one option for doing this would be with VPN.ac. They offer a secure browser extension for Firefox, Opera and Chrome. When you activate the secure proxy in your browser, it will encrypt and secure traffic for the browser (and not for everything else). Here is a screenshot I just took with their Firefox extension.